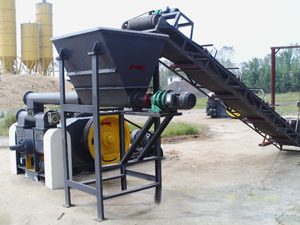 Mechanical Piston Biomass Briquette Press has remarkable features like high output, low electricity consumption, less limited on raw material size, and etc. It is a die and punch type mechanical press with two fly wheels. Each fly wheel is driven by belts with motors. 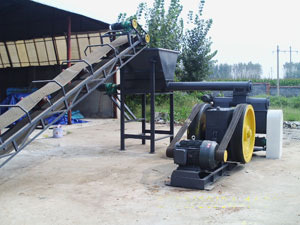 Material is continuously fed through a hopper by means of belt conveyor with its own gearbox and a motor. From feeding chamber, material is compressed by ram through taper bore die. Briquettes comes out from cooling line. Total process is continuous and controlled by electric panel. 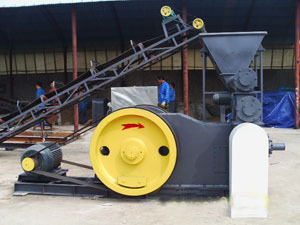 Briquetting press is used for production of high density fuel briquettes, i.e. "biocoal" from all types of biomass. Residues and wastes such as groundnuts shell, wood waste, baggasse(sugarcane stalk), cotton shell/stalk, mustard hus/straw, coffe husk pine needle, sawdust and etc. Acceptable moisutre in raw material of briquetting is 8-25% based on different raw materials and shape/size of briquettes you want to make. KJ Industry now has two models of piston briquette machine, KJY-500 and KJY-1000, with production capacity 400-500kgs and 800-1000kgs per hour depends on different raw material. No binder is necessary to make clean and green briquettes. Output briquettes will have 500-1000kcal more calorie than material before being processed on. Raw material like rice husk, wood shavings can be used directly without grinding. 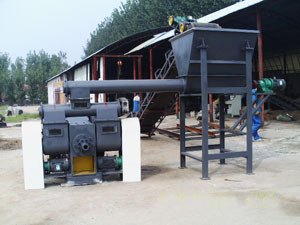 We also have wood chippers, hammer mills, dryers to help you prepare raw material before briquettting. Please check with us for certain models. Every equipment will be built to order for you and can be delivered to your export broker, or I can handle the entire process for you with my shipping agent. I can get a more specific price for shipping if you will e-mail me with your address.